Within physical architectural spaces, and in this work Through, I have used light as a material that radiates outside of its boundaries and containers. 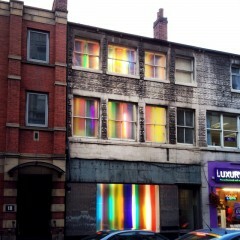 I have playfully refracted light through the several outward facing windows of And Model Gallery in Leeds using translucent, transparent or reflective materials, directing the flow of artificial light. 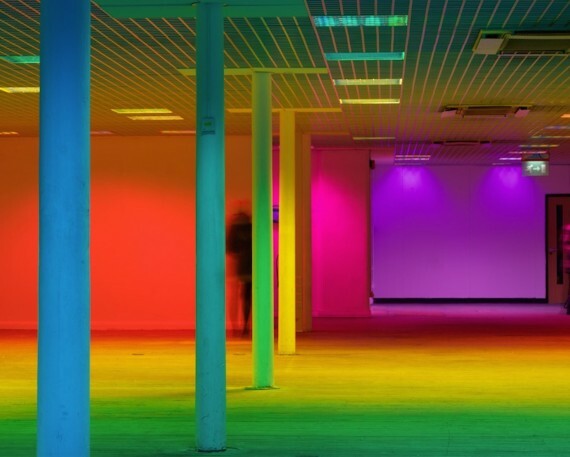 These ephemeral interventions forge new spaces and environments, by flooding a physical site with a rich mixture of light. This project forms part of a recent series of spatial light works based on my ongoing research into colour theory and light fields. The saturated light in this work casts sumptuously vivid colour reflections out of its containing space, through the windows, and reflects onto the road below. 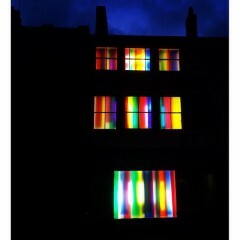 In the evening the darkness outside raises the strength of the illumination and the colour intensity in the work. This new work will be in-situ at &Model from 11 March until 29 March 2015. It will be viewable from outside the gallery only. For further details about Through and my future projects please visit www.liz-west.com.